If you cannot remove your glasses for medical reasons, you’ll need to obtain and submit a signed statement from your doctor with your passport application. Don’t take your passport’s expiration date at face value. Some countries have a six-month or three-month passport validity rule that requires your passport to be valid for a certain amount of time after your date of entry. If your appearance has changed significantly, you’ll need to apply for a new passport. That means if you’ve lost (or gained) a lot of weight, so much so that you look different than you do in your passport photo, you’ll need a new one. The same is true if you’ve undergone “significant facial surgery or trauma,” or if you’ve added or removed large facial tattoos or piercings. 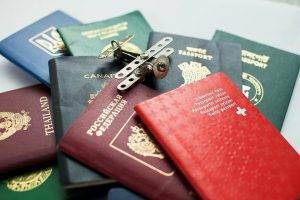 Normal wear and tear is forgivable, but if your passport has been significantly damaged, it’s time for a new one. Water damage, significant tearing (especially on the book cover or the page with your personal data and photo), unofficial marking on the data page (keep kids with crayons well clear), and torn out visa pages are among the types of damage that will likely mean you’ll need to apply for a replacement.